Example 1: run the MyCode procedure at 6:15 pm - Application.OnTime TimeValue("18:15:00"), "MyCode"
The following example use the Application.OnTime method to control a number of clock interfaces. Five examples are shown in figure 1, and the code is provided in sections 1.1 to 1.5. Procedures can be run and stopped from on-sheet ActiveX controls. 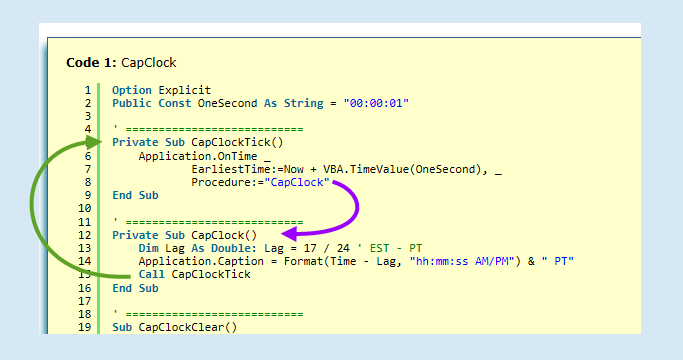 The AppCap clock is also fired by the Workbook Open and BeforeClose events. A ClockClear procedure to break the loop between the procedures in points 1 and 2. Fig 1: xlfAnimation :: WS Clocks - 1. Application.Caption, 2. WS.Name, 3. InCell, 4. OnSheet, and 5. ProgressBar. Click image to enlarge. Adding a clock to the Application.Caption in code 1 line 7. The clock is updated at one second intervals as set by the Const OneSec As String = "00:00:01" in line 2 and EarliestTime:=Now + VBA.TimeValue(OneSec) in line 14. Const OneSec As String = "00:00:01"
The loop between the Clock and ClockTick can be seen in figure 2. Both the Workbook Open event and the on-sheet control run the CapClock procedure. This avoids a one second initial lag if the loop started at CapClockTick point. Adding a clock as a Worksheet name is unusual, and also makes subsequent code referring to the sheet by name virtually impossible. On occasions, the user may wish to add a new worksheet named with the date. The date however is less interesting when recording the example shown in figure 3. The operation of the clock is identical in each of the following examples. All versions only differ with the target, where the time value is written to. In this example Code 2 Line 33 writes the time to a Worksheet tab Sheet2.Name = Format(Time, "hh-mm-ss AM/PM") & " AET". The colons used in line 7 are illegal characters with a Sheet name and "hh:mm:ss AM/PM" has been replaced with "hh-mm-ss AM/PM" format. Sheet2.Name = Format(Time, "hh-mm-ss AM/PM") & " AET"
The TextBoxes are members of the Shapes collection, and though the object hierarchy are members of the TextFrame.Characters collection. This is a variation of the in-cell clock described in section 1.3. The values are no longer Dates and Times but animated Text strings.